We are a group of aviation enthusiasts, assisting each other to build, maintain and operate sport aircraft. We educate our members to continuously improve safety outcomes. Welcome Guest. If you have an account or you're a member please Log In . Flight Ops Support for SAAA Members Climbs to New Levels! AusFly 2019 – All Aviators Under One Sky! If you’re thinking about building your own aircraft, then the SAAA is your best starting point. 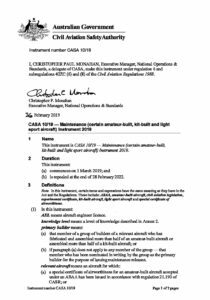 SAAA is likely the most cost effective & expert supported environment to build, maintain & fly Experimental Category aircraft. Check out our aircraft build support program, and our type transition and re-current flight training program – SAAA supports Members with aircraft builds, flight ops and maintenance.